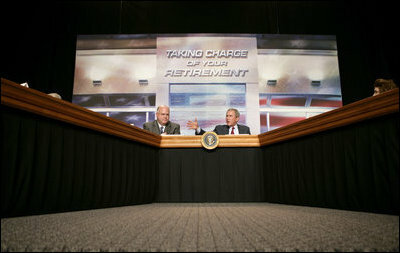 President George W. Bush opens the discussion during a roundtable meeting on Strengthening Social Security at the University of Texas Medical Branch in Galveston, Texas, Tuesday, April 26, 2005. "In 1950, 16 workers were paying for every beneficiary," said President Bush. "Today, there's 3.3 workers for every beneficiary. Soon there's going to be two workers for every beneficiary."